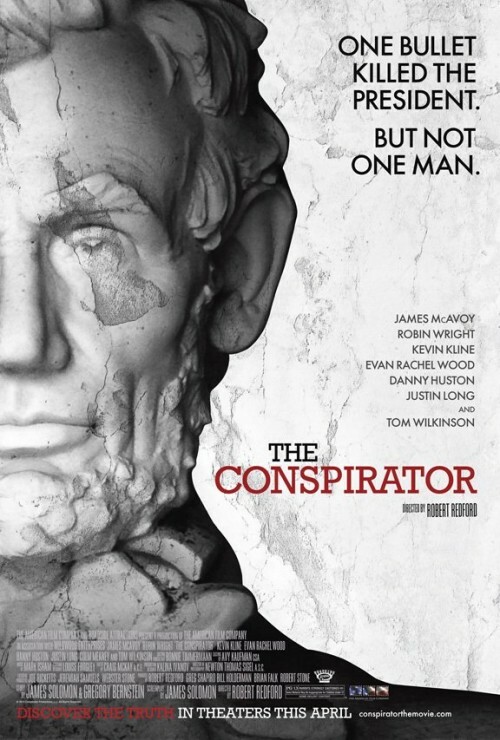 The Conspirator — effective message…if you can stay awake. Robert Redford can usually be depended on to deliver slow, but meaningful films. A River Runs Through It, Ordinary People, Quiz Show, The Milagro Beanfield War. All good stuff. But, I think he’s gone a little far with The Conspirator,and pushed it into something I would expect on the History Channel. I have no doubt that everything it absolutely accurate, but so is a phone book. Accurate does not mean entertaining. Basically, the story takes place just after the Civil War. John Wilkes Booth shoots President Lincoln in the head, leaps off the theater box onto the stage below, yells Sic Semper Tyrannis and runs off with a broken ankle. In the aftermath, the Government goes nuts, and despite the death of Booth in a burning barn, there must be someone to make an example of. This could not possibly be the act of one man. 10 people are brought into custody under suspicion of conspiracy. One of which, is innkeeper Mary Surratt (Robin Wright), who is accused of contributing by housing Booth, and providing the rooms in which the assassination was planned. Her lawyer is a young war hero, Frederick Aiken (James McAvoy), who is delegated to her defense despite his beliefs on whether she is guilty or innocent. The film itself has little to do with whether Surratt was wrongly convicted. Instead, it circles around the idea that she was not tried by a jury of her peers, but rather a military tribunal. Effectively removing most of her Constitutional rights to a fair trial. Upon finding Surratt guilty (Yes, spoiler alert, but this is history folks… its like I would ruin Titanic if I told you the boat sank)… after she is found guilty, Aiken, appeals to President Johnson through the writ of Habeas Corpus, which is denied, the President declaring that the writ is suspended in this case. The message is clear: The United States has a judicial process where the accused are presumed innocent until proven guilty… unless officials decide they are not. And the message a hundred and fifty years ago is even more relevant today with the same excuses from the government: sacrifice our freedom to make an example of terrorists. If you can stay awake for the duration of the film, and get through Justin Long’s bizarrely flat performance as Aiken’s best friend, you may enjoy the performance from McAvoy, who I guess could have benefited from his Professor Xavier powers from his other film this year, X-Men: First Class. Tom Wilkinson is great in his brief role as Reverdy Johnson, the lawyer who passes the buck of defending Surratt down to the young and hesitant Aiken. And Kevin Kline is nearly unrecognizable as Secretary of War Edwin Stanton – which is a good thing, showing Kline’s ability to dissolve into his character when he wants to. The primary benefit from the film lies in Aiken’s closing arguments, which Obama and the entire Legislative and Judicial branches should probably review. Robert, I appreciate your film-making. I really do. But lets pick up the pace. Maybe Mary Surratt could have made a run for it and jumped off a cliff into the river below. Worked for you! This was a great movie. It really made Mary Surratt into a real person for me. My husband and I are about to open a bed and breakfast just across the river from Garrett’s Farm where John Wilkes Booth died. The property is the birthplace of James Madison. Just this week I have confirmed that the detachment that pursued Booth and Harold stopped at the property and ate and slept there.